Benjamin Franklin employs a garden analogy in his plan for moral perfection. periods each day. Children learn best by gleaning themes and values from the stories on their own. They are also very good at observing the examples of those around them. Many stories offer examples of several valuable character traits wrapped up in the single character. It isn't necessary, nor is it recommended, to make a systematic study of individual values at this age. LET the stories do the teaching. Libraries of Hope has some wonderful resources and podcasts about character building in young children. Click here to learn more. When children reach the age of eight years old, they show readiness to be accountable for their own actions, recognize the difference between right and wrong, and need opportunities to choose for themselves the types of individuals they want to become. They may recognize weakness (or as Benjamin Franklin stated, "faults") they want to overcome. If hearts have been nourished by the Well Educated Heart model, children will be ready at eight years old to take on this responsibility. If children are not yet ready, it is wise to step back, build the strong loving relationship with the child and nourish the heart using the Heart Essentials listed on this site and the learning techniques explained so well on the Libraries of Hope site. The character building method below is very effective in helping individuals stay focused on positive characteristics they would like to develop. This method can be used to add virtues to a character or it can also be applied to overcome negative habits that may have developed. To overcome the negative, it works well to recognize first the negative trait that is a concern and then select a virtue that is opposite of the negative trait. Design a learning experience using the steps of the garden allegory below to overcome the negative and replace it with the positive. of the oppostive virtue, thus automatically washing from our natures all trace of the offender. Benjamin Franklin's method for character building is most effective for the older child or young adult who can CHOOSE for themselves which virtue to practice. This method is not intended for developing desire but instead to give the learner an opportunity to act on desires that have already developed within their hearts. The following diagram and summary illustrates how to use the garden allegory to develop good habits and character traits. Seed Selection: Identify a virtue, principle or idea that you want to incorporate into your memory and character. 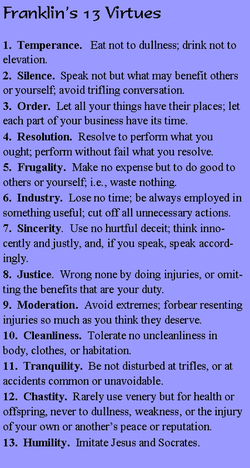 It may be one of the 13 virtues in Benjamin Franklin's list, or it may be a more specific virtue that falls into one of the 13 categories. Capture the inspiration and guidance that comes during prayer, Bible study, listening to good music or reading good books. Take note of the virtues you want to incorporate into your character. Give yourself the freedom to be specific as you set your goals. Soil Preparation: Take some time to read the Bible and other Classics that teach about this specific virtue or principle. As you read or listen to others expound upon this virtue, clarify your own thoughts by taking notes, highlighting, circling, underlining, and emphasizing specific related ideas. Expand your insights and define specifics. Identify short quotes or declarations that speak to that virtue. Organize your thoughts into an action plan. Create a learning experience in your mind that will allow you to practice the virtue. Practice the virtue for a few days or a few weeks. Record your observations and experiences. Use an MP3 or IPOD device to download a lecture or music that teaches or reinforces the virtue. Listen while you exercise, drive, work, etc. ​Capture the Sunshine: The sun symbol is in the center of the diagram to suggest the daily need for light from above to be included in every step. Take time each day to record moments of inspiration, to enjoy little things like a beautiful sunset or a baby's smile. Record ideas that come to mind to do good, to serve others, and to connect with family and friends. Follow through with these ideas by making obedience to impressions a top priority. Weed it Out: Solidify the information in your mind and heart through review and visualization. Discard ideas or habits that run contrary to the principle or virtue. Summarize the things you have learned. Think about how you can apply it in different situations. Use your newly acquired understanding in your life as a leader, a servant, employee, family member, or friend. Record your thoughts in a journal. Create a tracking record to make notes of successes and set backs. Share the Harvest: This is an opportunity to take the things you have learned and put it in your own words or your own creation. Write music, create a poem, present a lecture, or teach others. Create and share something related to the virtue. Give your knowledge away. The more you share your knowledge with others, the more it becomes yours. ​As children read the stories in the McGuffey Readers they will be introduced to even more virtues that can be developed by using this process. Our McGuffey Reading program introduces these virtues as "heart potentials" as children read the stories in the McGuffey Second Reader. Click here to learn more.